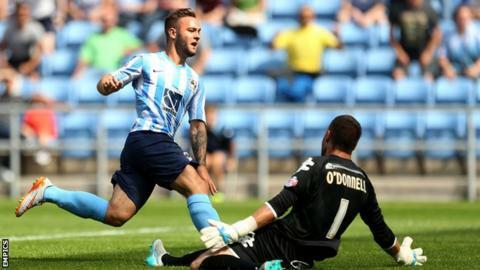 Adam Armstrong's double handed Coventry a comfortable opening day victory over Wigan at the Ricoh Arena. The 18-year-old opened the scoring as he met Jim O'Brien's through ball and tucked the ball into the left corner. With Wigan pressing for a second-half equaliser, the Sky Blues broke and Armstrong met John Fleck's cross from the left with deft touch from five-yards out to double the lead. Armstrong was denied a hat-trick after hitting the post with 15 minutes left. "The goals were what we worked on all week, nicking it off them, Adam Armstrong running in behind and running in on goal and scoring. "Today Armstrong had to play a little bit wider because of the shape of the opposition. Some games he'll play straight down the middle and hopefully terrorise teams. "In defence today I thought Reda Johnson and Sam Ricketts were excellent and their experience was important. I thought Romain Vincelot broke up the play exceptionally well and Armstrong was a constant threat." "We were confident going into the game and we believed we could win. "We caused ourselves too many problems and Coventry played counter-attack football, we played right into their hands and gave them opportunities"
"We have to better set-up than that when we lose the ball." Match ends, Coventry City 2, Wigan Athletic 0. Second Half ends, Coventry City 2, Wigan Athletic 0. Attempt missed. Adam Armstrong (Coventry City) left footed shot from outside the box misses to the right. Attempt missed. Sean Murray (Wigan Athletic) right footed shot from outside the box is high and wide to the left. James Maddison (Coventry City) hits the right post with a right footed shot from outside the box. Kevin McNaughton (Wigan Athletic) is shown the yellow card for a bad foul. George Thomas (Coventry City) wins a free kick in the defensive half. Foul by Kevin McNaughton (Wigan Athletic). Corner, Wigan Athletic. Conceded by Romain Vincelot. Attempt blocked. Michael Jacobs (Wigan Athletic) right footed shot from outside the box is blocked. Sean Murray (Wigan Athletic) wins a free kick in the defensive half. Attempt missed. Michael Jacobs (Wigan Athletic) right footed shot from outside the box misses to the right. Attempt saved. Max Power (Wigan Athletic) left footed shot from outside the box is saved in the centre of the goal. Substitution, Coventry City. George Thomas replaces Jim O'Brien because of an injury. Attempt missed. Reece James (Wigan Athletic) left footed shot from outside the box misses to the left. Substitution, Coventry City. Bryn Morris replaces Ruben Lameiras. Substitution, Wigan Athletic. Sean Murray replaces Donervon Daniels. Attempt saved. David Perkins (Wigan Athletic) left footed shot from outside the box is saved in the centre of the goal. Ruben Lameiras (Coventry City) wins a free kick in the defensive half. Adam Armstrong (Coventry City) hits the left post with a right footed shot from outside the box. Reda Johnson (Coventry City) wins a free kick in the defensive half. Goal! Coventry City 2, Wigan Athletic 0. Adam Armstrong (Coventry City) right footed shot from the left side of the six yard box to the bottom right corner. Assisted by John Fleck. Kevin McNaughton (Wigan Athletic) wins a free kick in the defensive half. Attempt missed. Chris Stokes (Coventry City) left footed shot from outside the box is close, but misses to the right.